Welcome to “Wanderlust.” The name Wanderlust means an insatiable desire to travel and is the travel blog for Texas Cruise and Travel. On this page you will find travel tips & hints, destination reviews, opinions, and postings on just about any and everything to do with travel. If you love to travel or would just love to be able to travel I invite you to sign-on as a follower of the blog. Becoming a follower of Wanderlust you will automatically be notified of new postings. Last Minute Cruise . . . . is it a Bargain? I have recently received numerous promotional pieces from some of the major cruise lines offering what they call "last minute fares" on their Alaska Cruises. As you know, if you are a regular reader of this blog, I generally advise clients to stay away from these last minute deals. I really believe planning and paying for your cruise vacation well in advance of your sail date is the best course of action in buying a cruise vacation. One of the reasons for this is that you can stop worrying about your vacation and begin anticipating it. Besides, I am not at all sure that just because a last minute fare is "cheap" it is really a good buy. There is an old adage that says, "You get what you pay for." I believe this is especially true in buying a cruise vacation. Now there is no question that the cruise lines such as Princess and Holland America (two of my favorite cruise lines) as well as others are offering some historically low last minute prices on their Alaska cruises. I've seen some cabins listed as low as $399 per peron based on double occupancy. However, you need to keep several things in mind before you allow them to run your credit card. First, not everything is include in that $399 fare. Not included in those prices are port fees, taxes, gratuities etc. Be sure to read the fine print in the offer as it may add additional restrictions to your cruise experience. Keep in mind that the left hand often takes away what the right hand giveth. Just saying, make sure you are buying what you think you are. Second, the odds of getting anything other than a small inside cabin are slim to none. Oh, there may be a few outside cabins available on a few sailing but the vast majority of these last minute sales are for the less desirable inside cabins. Why, you ask . . . well, they are all that is left. Early bookers of inside cabins have been upgrade and that leaves only inside cabins available. So, if your OK with a cabin without a view on a cruise where about half the value of the cruise is the view then you're OK.
You will also want to remember that while a cruise fare may be cheap airfare is not. Airfare in general is up and summer airfare to popular destinations is up even more. The airlines know what cities and which days ships embark for their sailings and seats on flights to those cities are have been adjusted upward accordingly. These will not be available on Cheap Tickets. Just a word to the wise at this point . . . summer airfare to Seattle, Vancouver and Anchorage (the principle cruise ports of departure for Alaska cruises) is up. In short what the cruise line leaves on the table the airlines have picked up. Before buying that last minute cruise deal make sure the airfare doesn't wipe out any cruise savings. Oh, your going to use your loyalty points to get your ticket. Don't think so. I believe you'll find that the desirable flights have no loyalty point seats available or even more cruelly they may have just one. Unfortunately airfare is not the only thing you should consider before shelling out that $399 plus. Truth is, whether your planning a summer vacation or contemplating a last minute cruise deal you need to focus on the ENTIRE vacation package and not just the cost of a cabin. When buying a last minute cruise you'll want to adjust your expectations downwards. Keep in mind that you're giving up your right to choose and you are settling for whatever you can get. As I have already indicated you will not get to select a cabin . . . it is probably going to be a small inside cabin. Additionally, because early bookers have already selected their dining times you're dinning time will be assigned based on availability. Specialty restaurants will more than likely already be fully booked and so you'll be wait listed. You may not learn of your reservation time until moments before you are expected. Shore excursions will also have been largely reserved by early bookers. So your choices may be very limited or you may just be on your own. You will also want to keep in mind that on Alaska cruises shore tours tend to be pricier than those offered on Caribbean cruises. Want a Spa experience on your last minute cruise. Well, get in line. The most desirable times have already been booked. The most likely available times will be when the ship is in port or when everyone else is at dinner. Another thing to remember is that if you can't find some one to travel with you at the last minute your going to probably pay double as all cruise fares are based on double occupancy. It is worth repeating that these Last minute fares are available in very limited numbers on a particular sailing and they will go fast. Additionally, if there is one thing I have learned in the travel business it is that fares, both cruise and air, change in minutes. So, if your really interested in booking one of these "last minute" cruises you'd better do it now . . . it may not be there tomorrow. Take my advice, save your $399 and put it towards the cruise of YOUR choice and as you plan a great cruise vacation enlist the service of a Travel Agent. 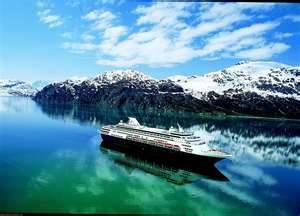 Here at Texas Cruise and Travel we recommend Holland America for Alaska.